When entering the housing market as a buyer or a seller, the importance of choosing the right Realtor is often times overlooked. Finding a “match” is an important step of the process: the wrong Realtor can turn what is meant to be a fun and exciting experience into a stressful one. With a surplus of local agents, selecting the best Calgary Realtor for you might seem like a daunting task. Below is a list of my top 3 things that, in my experience, have helped people find the right Realtor for their needs. Whether you are buying or selling, there are fundamental guidelines for approaching the task of hiring a real estate agent. You are trusting your Realtor to be knowledgeable in guiding you to make one of the biggest investments or sales of your life – it’s important to have a good relationship with them! Like in any relationship, you and your agent will spend a significant amount of time with each other; you will share some very exciting moments, and some stressful ones. it’s important to consider this, and try to find an agent you feel comfortable with. In my experience, the three most important aspects of a positive relationship with your Realtor are trust, respect, and a personal connection. Your Realtor should have compassion for you and your situation, and you should feel confident knowing that they have your best interests at heart. See if they mitigate risk. Two great qualities in a Realtor are transparency and honesty. A Realtor that downplays the risks of buying or selling a home may cause headaches in the future. Note that there is no extra cost for you as a seller to have a Realtor who does professional marketing of your listing. It’s all at the cost of the Realtor. So, if you choose an agent who invests in professional marketing you’re getting that service free of charge! Pay close attention to the price they value your home! Beware of Realtors that significantly overprice your home. This may lead to a slow sale and ultimately a lower sale price. NOTE: It’s important to make sure that the Realtors you are meeting with all know that you are in the interview process to avoid awkward situations. Their website: a Realtor’s website can reveal a lot about them, including testimonials, property types, and their marketing strategy. • If you are buying: look at their listings. Do they have listings for what you are searching for? Some Realtors place a focus on a specific property type, so ensure that they have experience with the type you are looking for. • If you are selling: check out their current listings. A lot can be revealed by how they market their current client’s homes, because they will do the same with you. • Testimonials. Many Realtors will feature testimonials on their page from happy clients, which can give you a feel for the type of clients they work with (if they are in similar situations) and their experiences. Online reviews: word of mouth is still one of the make or break factors of any business, and with the internet it’s simply more accessible. Take advantage of it! A few great websites for Realtor reviews are Rank My Agent and Rate My Agent. Businesses ask for references when recruiting employees, why shouldn’t you? You are hiring them after all! Never feel like a nuisance for doing your due diligence. Talking one on one with a past client can reveal a world of information. If they are reluctant, that tells a story in itself. Pro tip: asking for references from people with your property type or from your neighbourhood is even better. I believe that real estate should always be a positive experience. 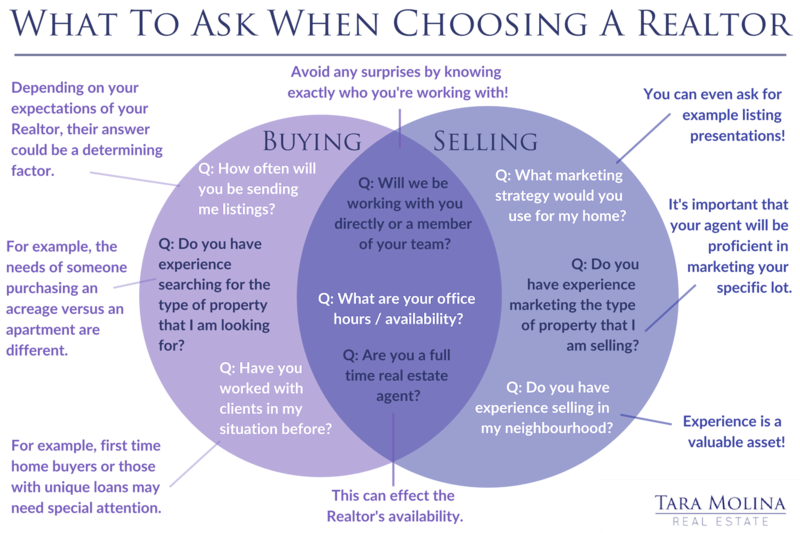 Choosing an agent may seem like an easy task, but the reality is it’s one of the most important decisions. It can be the difference between getting the property you want or selling at a top price.. If you do your research and ultimately go with your gut feeling, you will make a great decision. The process of selling or buying a home should be incredibly exciting, and your Realtor should only enhance the experience by making it as seamless as possible. Let me guide you through this process, as your preferred Calgary Realtor I am always keen to help my clients have the best real estate experience possible. Start your real estate journey NOW! We are focused on providing you with the best results and service in the industry. Talk to Tara about your options!